New Delhi: The re-exam of CBSE's class 10 Maths paper will only be held in Delhi and Haryana if the police investigation points to a "large-scale leak", said Education Minister Prakash Javadekar, stressing that more than 14 lakh students of Class 10 will not have to give a re-test. However, the Class 12 Economics paper that leaked this week will be held across the country on April 25, the government has said. The re-test of the Class 12 paper will be held without waiting for a detailed inquiry to ensure that the results are declared in time for students to meet deadlines for university admission. "As far as Delhi and Haryana, where police investigation is on, retest for Class 10 Maths will be conducted only if investigation points to large scale leak. There should be no confusion," Mr Javadekar tweeted. "I am amazed to see headlines in some news channels about confusion over retest. Out of 16 lakh students, more than 14 lakh students of Class 10 will not have to give retest in Maths. This is final decision." No re-test will be held at CBSE schools abroad because there is no information that the leaked question papers were accessed by students there, the education secretary said. "You can always question a decision but we had to take the best possible decision, given the information that was available to us," he said, underlining that there are no perfect answers. Union Education Secretary Anil Swarup said the government and the CBSE had taken different approaches to deal with reported leaks of the Class 10 Mathematics and Class 12 Economics paper. Since most Class 10 students continue in the same school, government sources explained, students would not lose their competitive edge to students who may have had access to the leaked papers. This isn't the case for Class 12 students where admissions to colleges would not only be determined on the basis of marks scored by them, but other students as well. The nationwide re-test for the economics paper is aimed at ensuring that students who had access to the leaked papers do not have an advantage in college admissions. Mr Swarup said any decision to hold the Class 10 Mathematics paper would ensure that the schedule of the students and their parents was not impacted. It also works well with the CBSE which holds compartment examinations, for students who fail in one subject, around the same time. The Union Education Secretary said it will take a month to find out how the leak happened and fix responsibility. "It would be our endeavour to see no leakage happens anywhere. We will try our best that no leak happens but you cannot guarantee that nothing wrong would happen in the future," he said. Angry parents and students have sought action against the CBSE, particularly its chairperson Anita Karwal. Mr Swarup has declined any action at this point of time. "You cannot hold someone responsible without an investigation," he said. "Let there be a clear inquiry and action will be taken against whoever will be at fault." 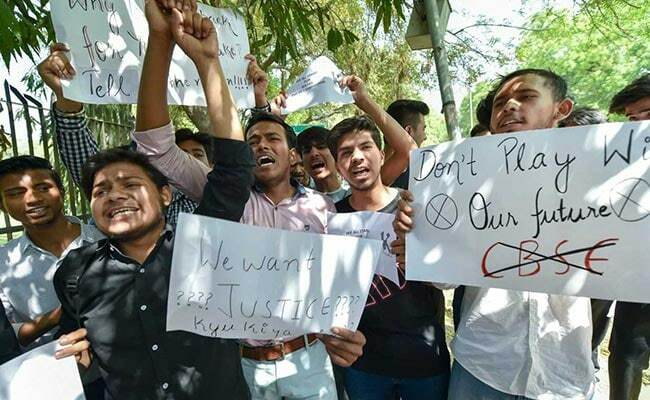 The opposition has stepped up its attack on the government over the CBSE paper leak. "PM wrote Exam Warriors, a book to teach students stress relief during exams. Next up: Exam Warriors 2, a book to teach students & parents stress relief, once their lives are destroyed due to leaked exam papers," Congress president Rahul Gandhi tweeted. The police have contacted Google, asking for details of the email address from where the CBSE chairperson was sent a mail on the Class 10 Mathematics paper being leaked.